RGCD: Introducing The New RGCD Shop! Well, it's not the system that was initially proposed about six months ago, but damn, it is at least better than a ridiculously long page full of PayPal buttons! The new RGCD Shop has finally arrived, courtesy of BigCartel - check it out here. I know it isn't perfect, but at least it offers combined shipping and a proper shopping cart. 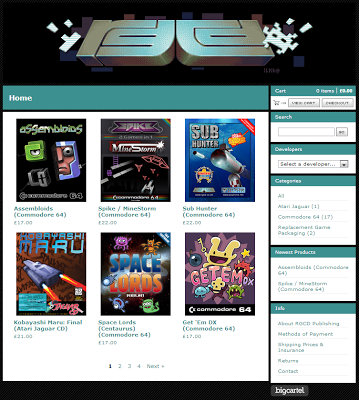 More of interest perhaps is the fact that we've been working away behind the scenes to extend the new 'deluxe' packaging across our entire catalogue of Commodore 64 games - and you can even buy the empty boxes too. Nice!